Econometricians seem to be rather slow to adopt new methods and new technology (compared to other areas of statistics), but slowly the use of R is spreading. I’m now receiving requests for references showing how to use R in econometrics, and so I thought it might be helpful to post a few suggestions here. 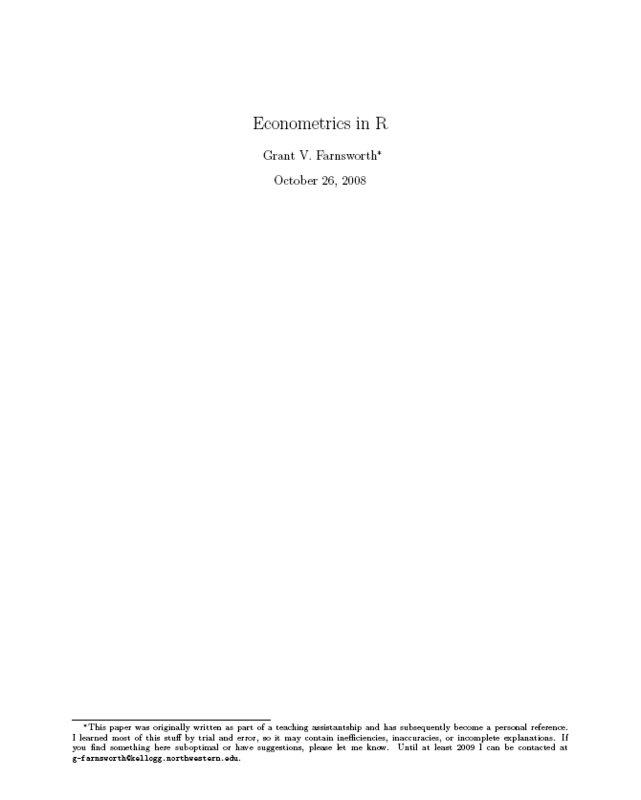 A useful on-line and free resource is “Econometrics in R” by Grant Farnsworth. It covers some common econometric methods including heteroskedasticity in regression, probit and logit models, tobit regression, and quantile regression. In the time series area, it covers ARIMA, ARFIMA, ARCH and GARCH models, as well as a few of the standard tests for unit roots and autocorrelation. It’s brief but it does provide code that will help people familiar with econometrics to get started using R.
If you are prepared to pay, an excellent book is Kleiber and Zeilis’s Applied Econometrics with R . It covers similar ground to Farnsworth but in more detail. This is the book I usually recommend to anyone with an econometrics background who is wanting to get started with R. It would also be very suitable for someone studying econometrics at about upper undergraduate level. Achim Zeileis is a well-known expert in R programming, so you can be sure the code in this book is efficient and well-written. Another useful book is Pfaff’s Analysis of Integrated and Cointegrated Time Series with R which covers unit root tests, cointegration, VECM models, etc. Vinod’s Hands-On Intermediate Econometrics Using R contains a lot of examples and code-snippets which can be very helpful. Unfortunately, the examples do not always show the best practice in R coding. More detailed case studies using R are provided in Advances in Social Science Research Using R , edited by H.D. Vinod. Many of the case studies are from econometrics including an excellent chapter by Bruce McCullough on econometric computing. There are of course dozens of books on R with a more statistical perspective, including several on time series. But I will leave them for another post.